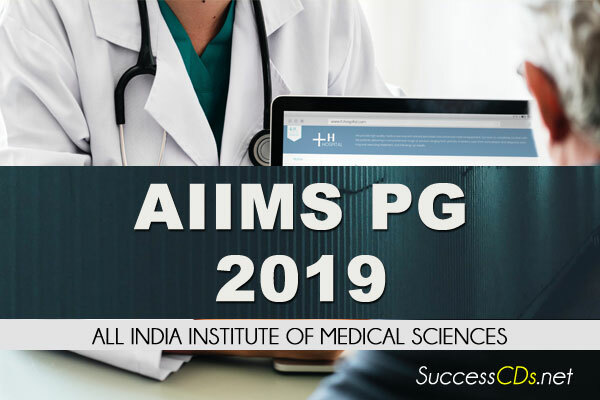 AIIMS PG 2019 for MD MS MDS Admission - All India Institute of Medical Sciences, New Delhi invites online applications for Entrance Examinations leading to admission in Postgraduate [MD/MS/ M.Ch. (6 years)/DM (6 years)/MDS] Courses of AIIMS, New Delhi and six other AIIMS (Bhopal, Bhubaneswar, Jodhpur, Patna, Raipur & Rishikesh) for July 2019 Session. AIIMS, New Delhi has invited applications for the entrance test in in Postgraduate (MD/MS/ M.Ch. (6 years)/DM (6 years)/MDS) Courses of AIIMS, New Delhi and six other AIIMS at Bhopal, Bhubaneswar, Jodhpur, Patna, Raipur & Rishikesh. AIIMS, New Delhi conducts AIIMS PG twice a year in January and July session. Details in this regard can be found at aiimsexams.org. AIIMS will conduct exam on 05th May 2019. The PG admission has already done in five AIIMS Bhopal, Bhubaneswar, Jodhpur, Raipur, and Rishikesh except AIIMS Patna. However, for AIIMS Patna it may be notified separately before counselling subject to approval/directions from competent Authority. In the field of Postgraduate Education, the most important function of the Institute is to provide opportunities for training teachers for medical colleges in the country in an atmosphere of research and enquiry. Postgraduate students are exposed to newer methods of teaching and given opportunities to actively participate in teaching exercises. The other important objectives of the Institute are to bring together in one place educational facilities of the highest order for the training of personnel in all the important branches of health activity and to attain self-sufficiency in postgraduate medical education. Candidates joining MD/MS/MDS degree Courses shall be called Junior Residents in the Clinical Disciplines & Junior Demonstrators in Basic Clinical Disciplines. Anaesthesiology; Community Medicine; Dermatology & Venereology; Emergency Medicine; Geriatric Medicine; Medicine; Nuclear Medicine; Obst. & Gynae; Ophthalmology; Orthopaedics; Otorhinolaryngology; Palliative Medicine; Paediatrics; Physical Medicine & Rehabilitation; Psychiatry; Radiodiagnosis; Radiotherapy; Surgery; Transfusion Medicine. Anatomy; Biochemistry; Biophysics; Forensic Medicine; Lab. Medicine; Microbiology; Pathology; Pharmacology; Physiology. Conservative Dentistry & Endodontics; Orthodontics; Oral & Maxillofacial Surgery; Prosthodontics; Endodontics & Preventive Dentistry. Candidate must possess a MBBS degree and should have completed the required period of one-year compulsory Internship. He/she must have obtained at least 55% marks in aggregate in all the MBBS professional examinations. The eligibility criteria are same as specified for MD/MS (3 years) courses. The method of selection and other terms & conditions for these candidates will be the same as for MD/MS courses. (Duration: 3 years). All applicants are required to visit the website regularly since all subsequent Corrigendum /Addendum /Updates will only be uploaded on the website. A candidate seeking admission to the Entrance Exam is required to submit his/her application in the prescribed format available online with the Prospectus on www.aiimsexams.org. The cost of Application Form includes the fee for entrance exam which is non-refundable and no correspondence in this regard will be entertained. Candidate is required to go through the prospectus carefully and acquaint himself/herself with all requirements with regard to filling in of the online application. Only those with accepted Basic Registration can proceed for Generation of Code for Final Registration. * The closing time will be up to 05:00 PM.